Assuming you’ve built a good relationship with your list, the bigger the list, the bigger the profits when you hit “Send”. But how do you get that list in the first place? Or how do you really grow your list fast when you’re just starting out? I’m going to show you exactly how to build your list fast, and how to make sure you’re also establishing a good relationship with subscribers on your list. How Can I Create A Better Lead Magnet? Answer: Get more specific about what the subscriber receives. That 5 letter word largely determines whether or not you’re going to get someone to submit their email address in your optin form. 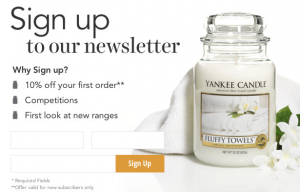 Well, one very easy way is to be more specific about what the subscriber can expect when they optin to your newsletter or sign up for your offer. If you guessed #3 and #5, you’ve got the idea. They’re definitely the most specific in this list. How Can I Create Better Optin Headlines? We will help you improve your content marketing. Well, how can you improve my content marketing? We will help you create content that engages your readers and gets them to act. Well, how can you improve my reader engagement and get people to take action? We can show you how to measure your content engagement better using Google Analytics custom reports. Well, how can Google Analytics custom reports help me improve my content? We will create a report that shows time on page so you’ll know which topics are the most helpful. Well, how can this report help me in my business? When you create more helpful content, your readers will read more, share more, and visit more often. And Google will notice and increase your rankings as well. Just by being more specific about what the subscriber is going to receive the instant after they subscribe, you establish more trust. WARNING: The easiest way to ruin subscriber trust is to not deliver immediately on your optin promise. Years ago, we used to offer a free keyword research course. It was solid content and was very helpful. There was so much information, that we broke it down into 5 different .pdf downloads. The plan was to deliver one .pdf each day, over the course of a week. The thinking was that it would allow subscribers enough time to take action on the information and actually benefit from it. Honestly, in my head, I was thinking, ‘They get instant access to the first report and then the other reports come over the next four days’. I said one thing and then did something different. So, the attempt to build trust with subscribers was lost since we said one thing and then delivered something different, even though I made an innocent mistake. Be very specific about what you’re going to give the subscriber. Then deliver on your promise. That’s the very first step after the optin to preserve the trust of your new subscriber. How Can I Prove I Will Deliver My Benefit? Answer: Show them that you clearly delivered this benefit before. My favorite marketing book (of all time?) happens to be Jump Start Your Business Brain, by Doug Hall. And there’s a very good reason why I chose this book. Rarely do you find a book that cost tens of millions of dollars to produce via statistical research spanning over 20+ years. If you haven’t already read it, drop everything and pick up a copy. I can’t cover a fraction of the gold nugget research in this book…just buy it…read it…study it. The core idea of the book is that after thousands of real world tests using actual products from companies you would recognize, there are just 3 big drivers of sales success. And if you get these 3 things correct in your marketing, you have a statistically higher chance of creating a successful product. Stated more specifically, once you’ve told the subscriber exactly what they will receive, you then need to prove, beyond a reasonable doubt, that you can deliver this benefit to them. The more believable your proof, the more optins you’ll receive. Let me give you a few simple examples, and then I’ll show you one more to really drive this point home. Which one of this has the most specific proof? Which one of these are you more likely to believe? Example C gives a very specific benefit claim and then backs it up with a screenshot showing they have already delivered on their promise before. The more specific you are with your proof, the more believable your benefit claim, and therefore the more leads you’ll generate with that form. He was very specific with his proof elements (the screenshot shows exactly the 110% increase claimed in his headline, along with a graph from Google Analytics). How can I prove they will get what I promise? How can I make my promise more real? How can I show them I’ve done this before? How can I show them getting what they want? How Can I Show A Dramatic Difference? Answer: Show them a clear “Before/After” example of someone like them. The third key mover of sales/persuasion success relates to the change that occurs in the subscriber’s life. The subscriber is currently in the “Before State”. After he gets what you are going to give him, the subscriber will be in the “After State”. Your job is to show the subscriber how different the current “Before State” is from the “After State”. Nobody does this better than the diet/health industry. The more dramatic the picture…the more dramatic the transformation in the life of the person. Your goal is to clearly demonstrate how different the life of the subscriber will be after they optin. I realize not every case will be like an 84 lb. weight loss transformation. The goal here is to clearly demonstrate in your optin form why it’s worth the time to submit their email. Once you get to this point, you’ll be getting new subscribers. How Can I Segment My Email List Better? Answer: Include unique offers in unique content. Ben likes computers and baseball. Aaron likes business and the Appalachian mountains. When I’m around Ben, I talk about computers and baseball 90% of the time. When I’m around Aaron, we talk about business or the mountains. If I want to build a strong relationship with Ben or Aaron, I have to talk about things that interest us. They get excited about certain topics, and get bored if you venture into topics they don’t care about. Don’t bore them with something they don’t care about. Not only do you want to be very specific with you optin offer, but you want to be very specific with the offers you put on each page. In my last post about how to grow from $0 to $8,540 per month, writing just 4 blog posts I mentioned the power of compound interest and content marketing. 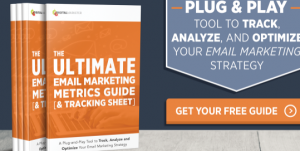 In that post, I mentioned that I was using the email subscriber LTV (lifetime value) for the sales attribution model. In short, I am able to use Drip to determine how much each subscriber is worth and what source they came from. And the way to get more subscribers from each blog post is to come up with something specific to offer at the end of the blog post, that will help the reader take action with the content they just read. What are the main obstacles the reader will face when taking action? Example: If your blog post was about using custom reports in Google Analytics, one obstacle might be setting up the Google Analytics tracking code correctly. Lead Gen Idea: Offer a video guide to get setup in Google Analytics in 15 minutes or less. What belief do my readers have that is holding them back? Example: If your blog post was about email marketing, one belief that might be holding your readers back is “sending html emails takes a lot of time”. What would speed up their return on investment? Example: If your blog post was about YouTube advertising, one problem your reader will face is getting their campaign setup correctly. Lead Gen Idea: Offer a 21 point step-by-step checklist so they get their YouTube video ads setup correctly every time. The idea is to offer something of real value to your reader, who has just finished reading your great content. It should be unique to the content and expand on the same ideas that they just read. The idea isn’t to overwhelm the reader with another 75 page .pdf about some topic they might be somewhat interested in. And when they optin, be sure to tag them for this topic. That’s is the key to really good email segmentation. As time goes on, you can test their interest in other topics, and then tag them for those topics if they show any interest. Humans do this naturally in relationships all the time. We come up with a new topic, then we gauge how the person we are talking to responds to determine if we should continue talking about this, or find something else to talk about. If you don’t have an email service provider that has a great tagging system, then again, I would recommend you check out Drip. 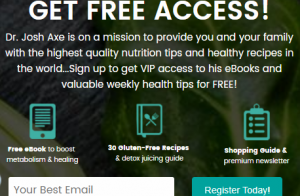 How Can I Engage My Email Subscribers More? Answer: Create and mix different media types in your offer. I was reminded about this last week. Mike brought up a great point. Let’s say you’ve been offering an ebook, “31 Ways To Get Actionable Data From Google Analytics”, on your website. Try mixing media types next. Take the ebook and make a video of the same content. Show the reader what to do, step-by-step. You could also create an audio version of the same content, and create an .mp3 version. Obviously, this will take some time. But, considering you already have the content, it’s not going to take nearly as much time as creating something totally new from scratch. And the increase in your optin rates could be substantial. Someone who may only be slightly interested in your ebook (or not interested at all), may be hooked by the idea of watching a short video that explains each step. And someone who isn’t interested in watching a video or reading a book, might be interested in loading the .mp3 on their ipod to listen to on their next commute to their office. You simply repurpose the content and mix different media types to reach the largest audience and increase your optin conversion rates. Now, let’s run the numbers. As you can see from the above example, the increase in optin rates and the value over time of those new subscribers will usually warrant creating the content, even if you have to pay someone to make it for you. How Can I Increase My Email Optin Rate? Answer: Split test the main media type in your offer. This tip goes with the previous one and is very simple. 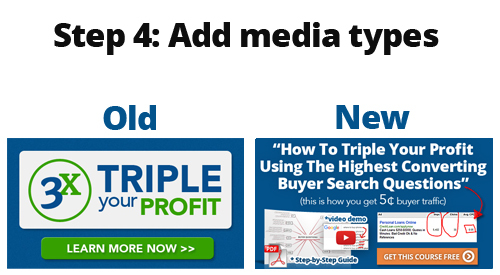 Once you have created the different media types for your offer, split test the main offer. For example, let’s say you have an optin form where the subscriber gets a checklist showing them how to install Google Analytics, a video walking them through the checklist, and a .mp3 file telling them the 21 ways most people make mistakes when setting up their Google Analytics tracking code. Create 3 different optin forms. The first form will primarily highlight the ebook. You can mention the video and audio as a secondary bonus for signing up. The second form will primarily highlight the video. You can tell them about ebook or audio as well in the copy. The third firm will highlight the audio, and you would mention the video and ebook somewhere else on the optin form. Then simply run the tests and crunch the numbers. You might be surprised at which one has the highest conversion rate. If you’re not currently using a optin form service that has optin form split testing, I would recommend ThriveLeads. As you already know, I’m a huge believer in split testing. I can’t tell you how many times I’ve run a test, absolutely sure I knew which offer would win, only to be surprised that I was wrong. Let’s recap, using a simple case study. I’m going to take one of my own optin offers that is performing poorly. I’m going to show you how to triple your profit. Well how are you going to triple my profit? 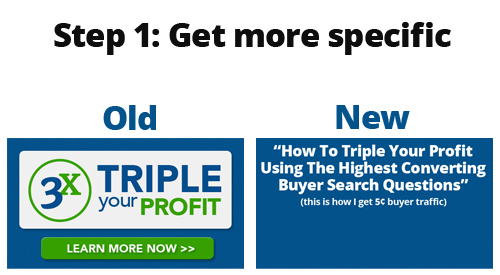 I’m going to show you the highest converting buyer keywords. Well how are you going to find the highest converting keywords? I’m going to teach you how to find the questions buyers ask just before they make a purchase. Well how are these questions going to help me triple my profit? I’m going to show you how easy it is to buy clicks and get targeted buyer traffic from these question terms. Well how am I going to make money from these question terms? 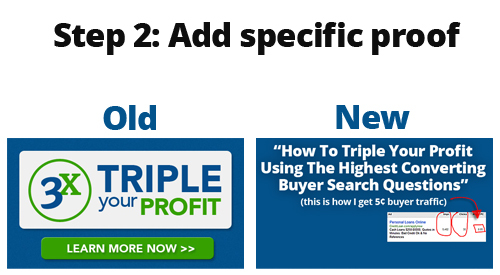 I’m going to show you how to get traffic and sales from the highest converting question words so you can triple your profit. For this next step, I simply grabbed a screenshot from my advertising account, showing how I used this method to get 5¢ clicks when others were paying $45 per click. I also added a simple arrow graphic to tie in the Headline/Subheadline Claim to the screenshot. This was definitely a little bit harder, because I started to run out of space. 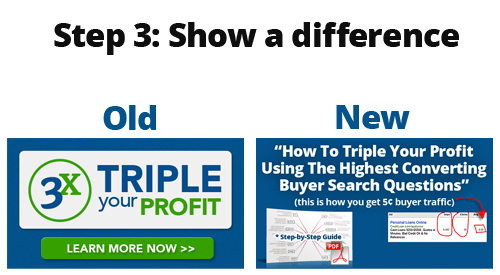 I decided to change “how I get 5¢ buyer traffic” to “how you get 5¢ buyer traffic”. That’s a subtle difference, but for some, it will help them think about their current traffic costs, and what it would be like to get traffic/buyers for just 5¢ per click. I added a screenshot of a .pdf guide and a .pdf logo and the “*Step-by-Step Guide” text. Since I was running out of space, I had to move some things around to make this work. I added a screenshot of a YouTube video, with the words “*video demo”. If someone isn’t interested in the .pdf guide, they might be interested in watching a step-by-step video demo of how this works. I also went ahead and added a call to action button. Instead of “Learn More Now” I chose “Get This Free Course”. I think the new version is much more specific about why they would want to click the button. Step 5 would be to split test the different media types. When you compare these two, you can see how the new version will dramatically outperform the old version. February 2018 Update: After I implemented this change in January 2018, I got a 650% increase in the optin rate. If you’ve read up to this point, you’ve got a good idea of what you can do. And you probably have a ton of ideas for testing. And you already know how these tweaks to your existing optin forms/email campaigns could greatly boost your overall profits. It’s easy to get excited about what can be done. It’s easy to plan things you could do. It’s easy to dream about what could happen. It’s hard to take action. I read every single comment and comment back as well. How can I make this more clear? Are there specific examples you need more help with? Nice post, Jack! Just wanted to drop a line and let readers know that they might be able to rent out the digital version of the Jump Start Your Business Brain book for free using their local library’s OverDrive partnership. I just got mine to read later. Hope all is well and loving the info! Thanks so much for the comment. I’m a huge fan of Overdrive and just checked out another 7-8 books yesterday. Thanks for the great tip. I have also emailed Doug to ask him when the next print run of his paperback book will be available. Will post any updates. It’s a great read. I’ve read it multiple times and I have also started outlining it. Once you really understand these concepts, you can start to predict sales success…it’s uncanny. Excellent Post, Jack. You do have a skill in breaking things down to easy understanding and implementation. I’m going to put your points into action today with my optin form. Thanks very much! Thanks Mike…sounds great and I wish you the best in your implementation!